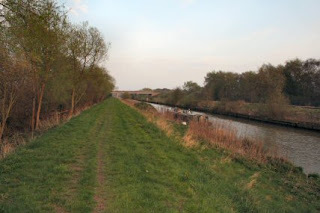 I have moved to what is usually a nice quiet spot near to the Lincoln bypass bridge and the Pyewipe Inn. Not today. If there were ten boat movements there were fifty. In the main it was the GRP boats from the marina having an outing while the weather was nice. I shall look forward to a dodgy summer!! The thing that puzzles me is the amount of wash kicked up by the GRP boats. Stop any one of them and they would say that they are going slow but to my mind most have them have never found the slow zone on the throttle. Generally – even narrowboaters aren’t perfect – I only spot a narrowboat after it has gone past but the GRP starts moving the boat about a couple of hundred yards before it gets alongside. I suppose it could always be that the GRP boats aren’t designed for canals. The cat has gone walkabout again. He’ll be back for his dinner as usual I hope. A thrilling day has been spent chipping rust and rerouting the bilge pump wiring so that the wires don’t get disconnected by being trodden on. All the jobs needed doing and it keeps me of the streets after all. It was quiet enough to start with!! A beautiful day for boating. Then three came along at once! Who said ‘A Change is as good as a Rest’?